Seoul is the capital of Korea and is the heart of Korea’s culture and education as well as politics and economy. Seoul is home to many historic sites and places of traditional culture. The shopping and entertainment districts also draw a large number of tourists every year. The Hangang River, which runs through the center of the city, is a distinctive landscape of Seoul that offers a myriad of resting areas for citizens. Incheon is the second largest port city in Korea and was a major gateway for commercial and cultural exchanges in the later part of the 19th century. It is home to Incheon International Airport, and is also the venue for some of Korea's leading music festivals and concerts. As such, Incheon is rapidly developing into a city of modern culture. 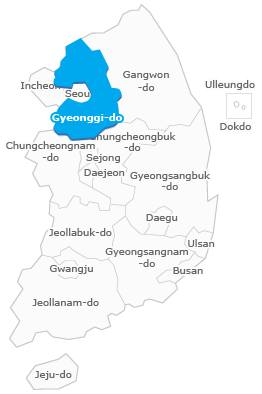 Gyeonggi-do is home to a large variety of tourist destinations, including cultural heritage sites, theme parks, the Demilitarized Zone (DMZ), and nature conservation sites. Also, thanks to its position surrounding Seoul and Incheon, Gyeonggi-do offers easy access to some of the most remarkable features in the nation’s capital city as well as in the leading international gateway city. Gangwon-do is blessed with beautiful mountains and clean beaches that offer some of the best sceneries and vacation spots throughout the year. The beaches are popular spots for watching the sunrise on New Year’s morning as well. Winter in Gangwon-do is heaven for winter sports enthusiasts, as the province gets a lot of snow. 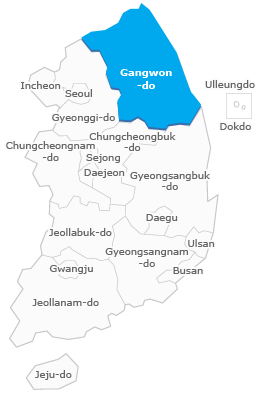 There are many ski resorts in Gangwon-do, including in Pyeongchang and Jeongseon. 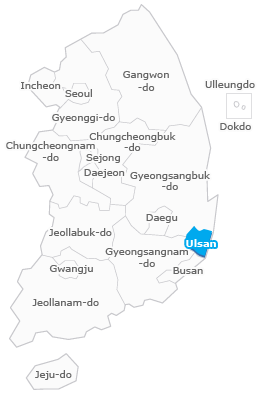 Ulsan is famous for whale watching, rocky cliffs, and beautiful beaches. Being the farthest east, the city is the first to greet the sun. Also, thanks to its coastal location, the city has emerged as a center of industrialization and maritime commerce. 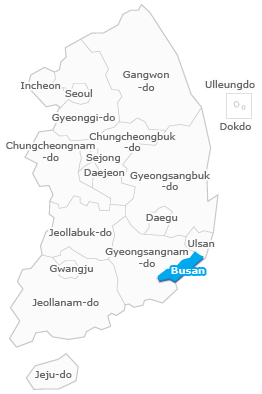 Busan is Korea’s largest port city, filled with endless excitement and pleasant surprises. Every year, tens of thousands of visitors from all over the country and around the world flock to the cities many beaches to relax or to attend festivals. The city annually hosts Busan International Film Festival (BIFF), and regularly holds events at the world’s largest department store. Jeju Special Self-Governing Province is a premier tourist destination, boasting mild weather and scenic beauties of beaches, waterfalls, cliffs and caves. Some of the top tourist sites include a national park with diverse flora and fauna, breathtaking views, and the world’s longest lava tube, registered as a UNESCO World Natural Heritage. Gwangju is the birthplace of the modern democratic movement in Korea and keeps the history well preserved. Today, Gwangju hosts annual cultural festivals related to both food and art. 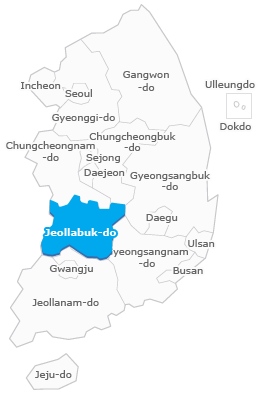 Jeollabuk-do is bountiful in traditional cultural heritages and historical sites. 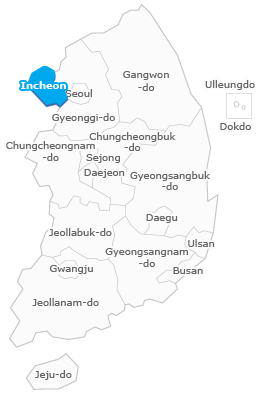 It is the setting of the famous pansori “Chunhyangjeon,” and a city famous for its hanok village and bibimbap. Experience the traditional culture of wearing hanbok, eating Korean food, and using hanji paper. 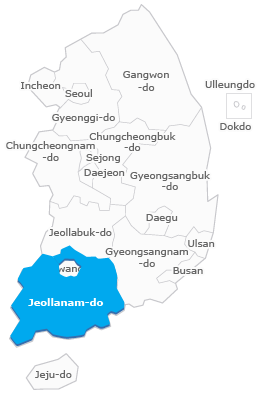 Jeollanam-do is famous for seafood, Pansori, and Arirang. It is home to diverse tourist destinations, from one of the world’s best-preserved reed bays to green tea fields, and many designated Slow Cities. 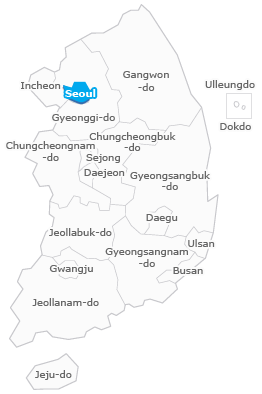 The F1 Korean Grand Prix also takes place here. Daegu offers the conveniences of a big city with the comfort of a rustic lifestyle. Major attractions include parks equipped with diverse recreational facilities, and a traditional herbal medicine market, which has been in operation since the Joseon Dynasty. 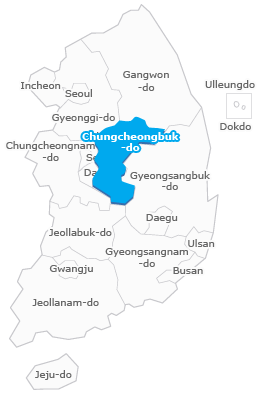 The uniquely landlocked Chungcheongbuk-do boasts remarkable natural landscapes, including mountains, lakes and caves. Visitors can relax at a water park that uses mineral water drawn up from rock beds 750 meters below the ground or visit the UNESCO Memory of the World Registered Jikji, the world’s oldest extant movable metal print book. 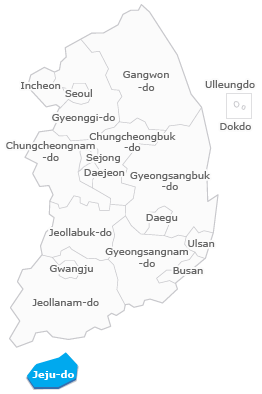 Chungcheongnam-do is mostly composed of plains and is a vital transportation hub connecting Seoul with the southern region by both rail and road. The famous Boryeong Mud Festival takes places on the beach every summer. Chungcheongnam-do also offers a variety of modern hot springs facilities. 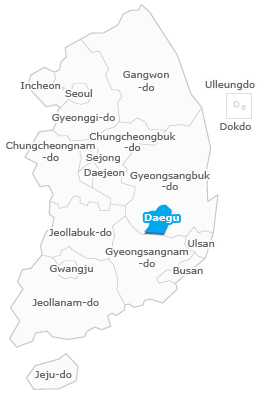 Daejeon is a large city located in the center of Korea. Major train lines and expressways go through this home of government, science and education facilities. Tourist sites include theme parks, water parks and a zoo. Gyeongsangbuk-do has long been the religious home of Korea. The city of Gyeongju, the old capital of the Silla Kingdom (57 BC-935 AD), is especially well known for Buddhist cultural heritage sites, as well as UNESCO World Cultural Heritage sites. National and provincial parks, as well as coastal walking trails, offer scenic views of nature. 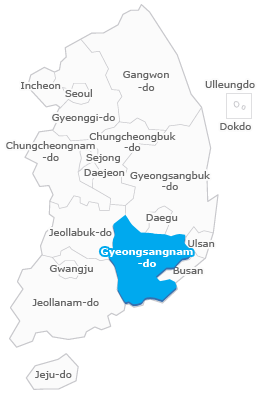 Located in the southeastern part of Korea, Gyeongsangnam-do is home to some of Korea’s major historical and cultural assets, including one of Korea’s greatest treasures, Tripitaka Koreana. This province is known for temples, cherry blossoms, green tea and literature. 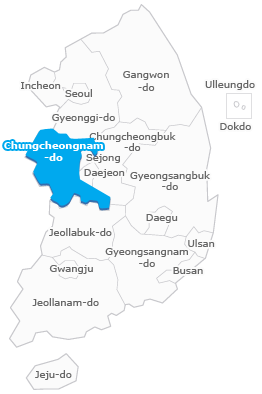 Sejong Special Self-Governing City borders Chungcheongbuk-do, Chungcheongnam-do and Daejeon. 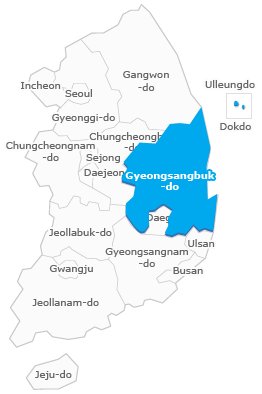 The city spans a 361.38-square-kilometer area, being comprised of the two previous administrative districts of Yeongi and Geumnam.